I got my package from Forever21, from the day where every penny we spent went to help Japan. I figured it was a good enough reason to finally try their nail polishes! After I ordered, I went looking to see if they were big 3 free. I guess the company that makes them is LA Colors, and they are formaldehyde and tuolene free, so I think I’m good! The next day I had some time, so I wanted to try one of my new Konad plates. I stamped this on with China Glaze Delight. I have more of their polishes to swatch. Isn’t that bottle cute? This entry was posted in general polish yumminess, konad, swatches and tagged brown, china glaze, creme, cupid, delight, konad, love&beauty, nail polish, pottery class brown, shimmer, swatch on March 26, 2011 by hollyshimmerspark. Cupid and some of my polish! 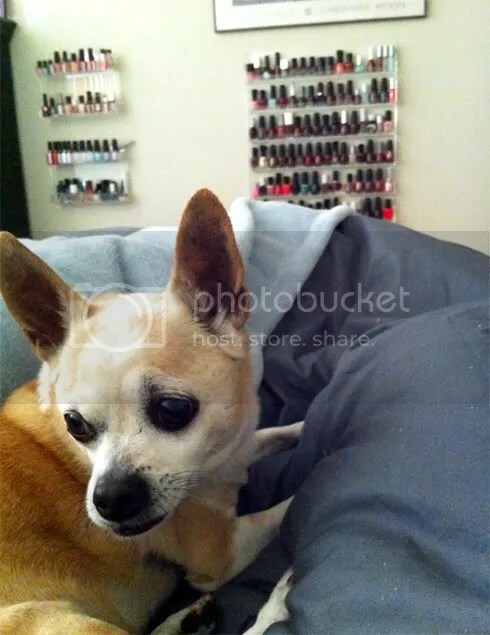 I got a cute picture of my dog and some of my nail polish that I have on my wall racks. This entry was posted in general polish yumminess, YAY! and tagged cupid, nail polish, wall rack on March 22, 2011 by hollyshimmerspark.